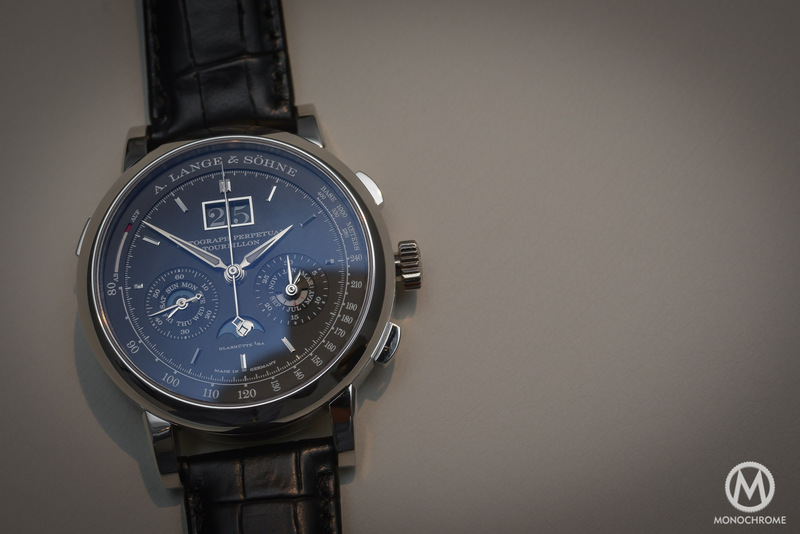 A superb colour combination, unprecedented at A. Lange & Söhne, for the uber-complex Datograph Perpetual Tourbillon. Introduced in 2016, the Datograph Perpetual Tourbillon ranks among A. Lange & Söhne’s most complex watches – together with the 2017 Tourbograph Perpetual Pour le Merite and the 2018 Triple Split. Featuring a flyback chronograph, a perpetual calendar with moon phases, an outsize date, and a one-minute tourbillon discreetly integrated on the back – there are lots of goodies in the package. For the SIHH 2019, this model is back with an unprecedented combination of a white gold case and a solid pink gold dial – a.k.a Lange’s version of the salmon dial. When it was revealed, the A. Lange & Söhne Datograph Perpetual Tourbillon appeared as the uber-version of the mega-version of the Datograph – which is already one of the most impressive chronographs on the market. Needless to say that this watch is a technical feast and is the tourbillon version of the perpetual calendar version of the Datograph. Following us? 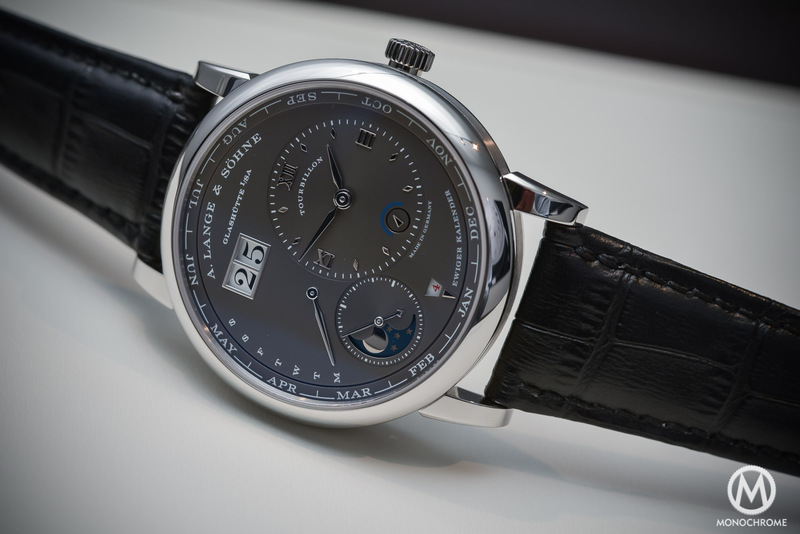 The first version of the A. Lange & Söhne Datograph Perpetual Tourbillon was made of platinum and featured a black dial. For 2019, there’s a new colour combination that has never been used at Lange – but we’ll get back to that later. What about the watch itself? Well, in short, it appears to be rather familiar and looks like a Datograph Perpetual from the dial side. 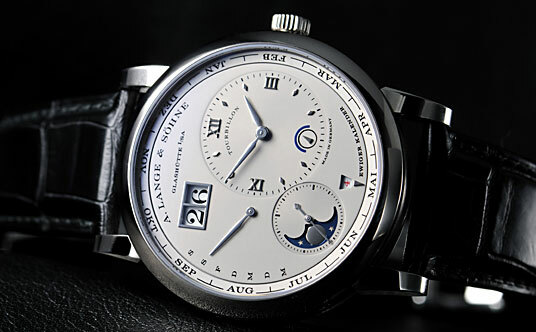 Same indications, same position of the sub-dials – except the specific, linear power reserve – and same moon phase at 6 o’clock and outsize date at 12 o’clock. Overall, not many differences at first. What changes, however, is on the reverse side. 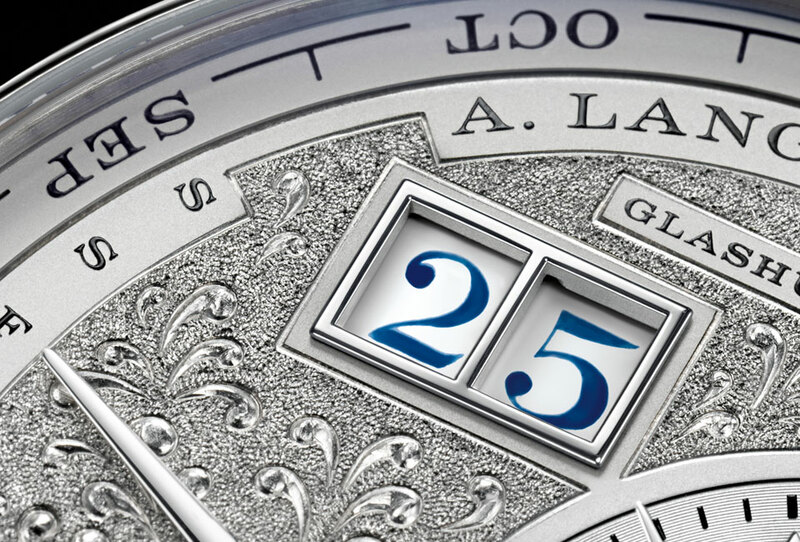 Instead of a traditional regulating organ, Lange integrates a one-minute tourbillon. The obvious reasons for placing the tourbillon on the back is to enhance the legibility and balance of the display and avoid a gaping hole on the signature Datograph dial. But, it’s also to reserve certain pleasures just for the owner of the watch. Even with such complexity, the A. Lange & Söhne Datograph Perpetual Tourbillon remains relatively compact, with its 41.5mm diameter and its 14.6mm thickness. Not an ultra-thin tuxedo piece, but we’ve seen even more pronounced dimensions for a chronograph of this complexity. The base movement remains that of the Datograph, yet has been extensively modified to receive a tourbillon. So what’s new about this 2019 Datograph Perpetual Tourbillon? First, this limited edition of 100 pieces is made of white gold, with a brown leather strap and a white gold deployant buckle. 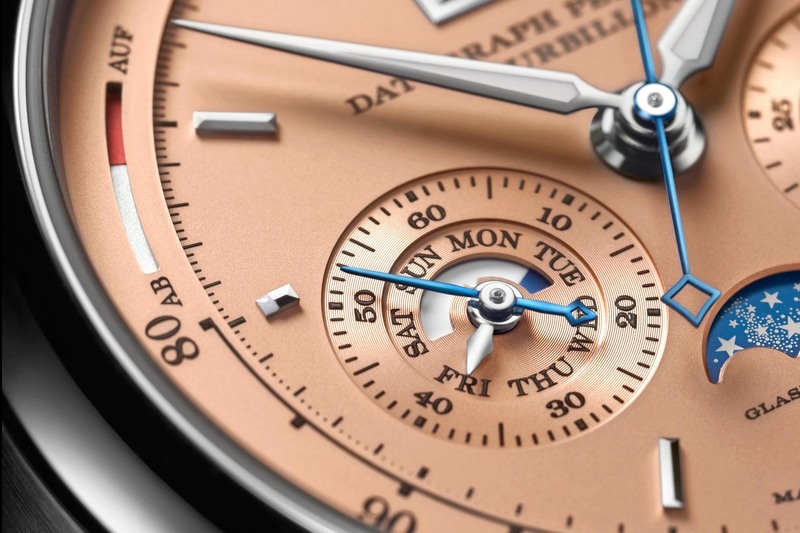 The real novelty is the dial, which is now made of solid pink gold, with a matte, grained surface. 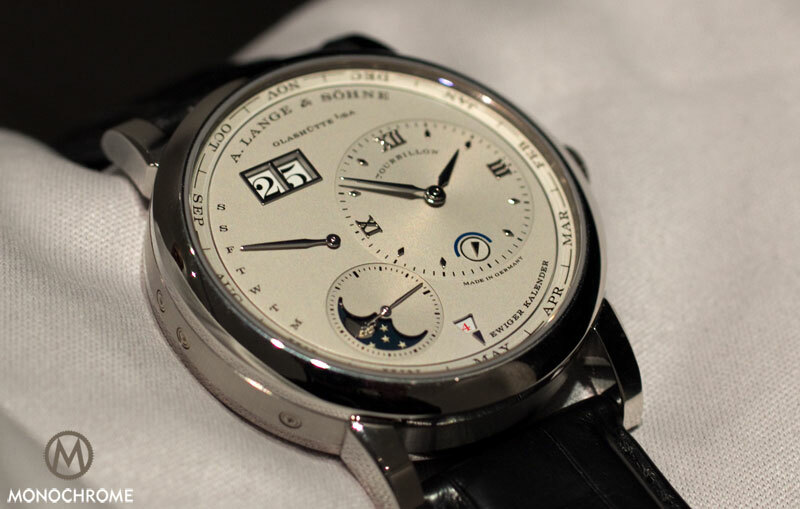 This is the first time that Lange uses this colour, in tune with the current taste for salmon dials. 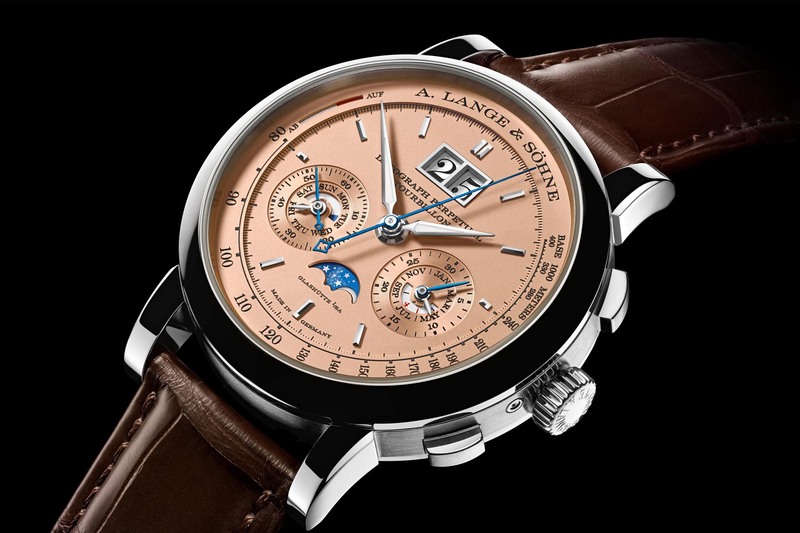 But Lange’s version notches up the luxury appeal and goes several steps further achieving a unique salmon hue from a solid gold dial. 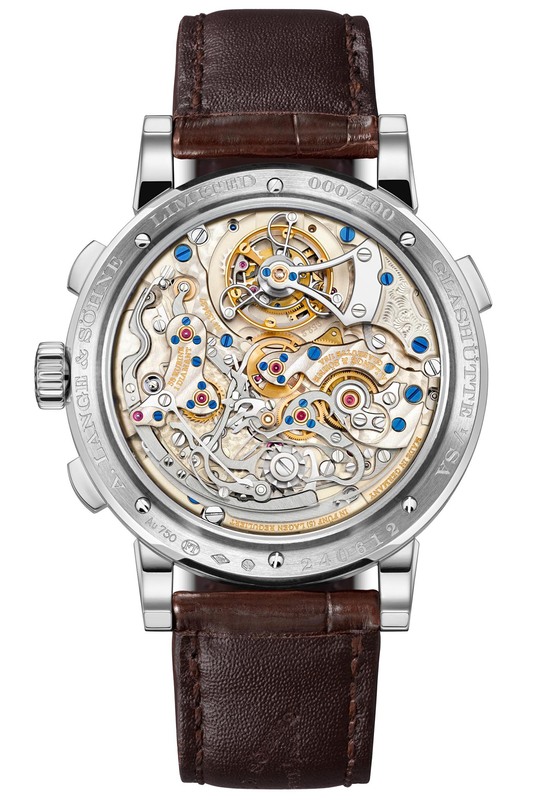 As mentioned, the movement is the same one fitted in the black dial model. This movement is mechanically and visually complex, a micro-city of bridges and parts with lavish decorations. 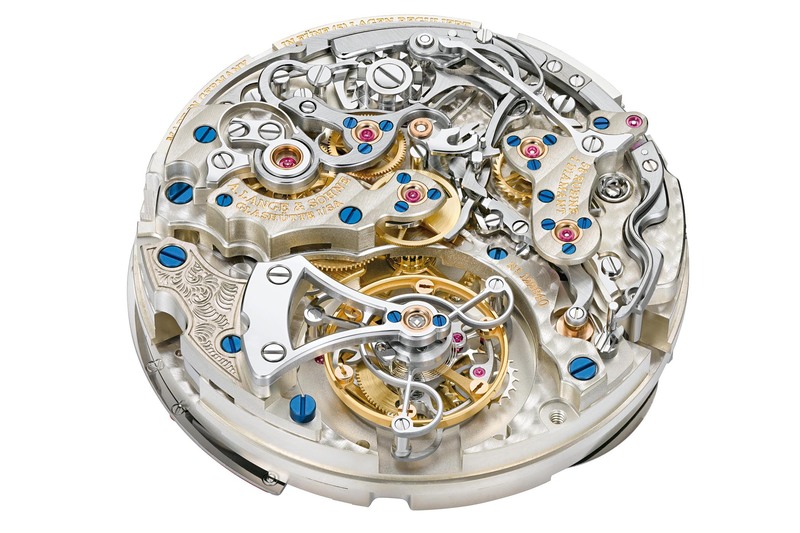 It comprises no fewer than 729 parts, including 1 diamond endstone for the tourbillon. The calibre L952.2 sees its one-minute tourbillon beating at 2.5Hz and boasts a power reserve of 50 hours. 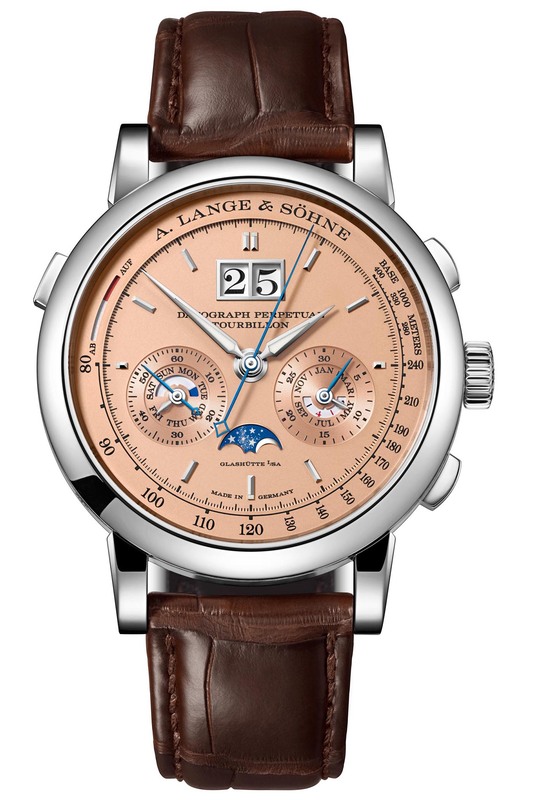 The A. Lange & Söhne Datograph Perpetual Tourbillon with Pink Gold dial (ref. 740.056) will be produced in 100 pieces, priced at EUR 285,000. 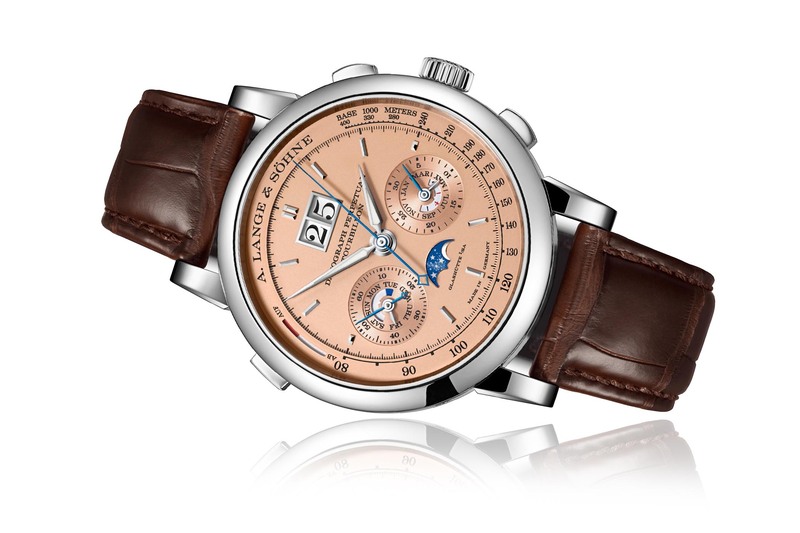 More details at www.alange-soehne.com.